We made it there and back safely, obviously, but it was a little scary at times. 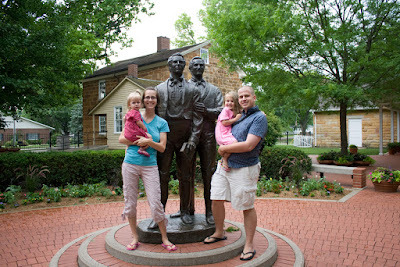 It took about forty-five minutes to drive out there so I can't imagine how long it took for Joseph Smith and the men accompanying him to get there since they were walking...maybe riding horses...the whole way. Times were certainly different back then and if you wanted anything while you were under arrest/incarcerated you had to pay for it yourself, including meals. Joseph had promised the brethren with him that they would be able to get something to eat before getting to the Carthage Jail. Unfortunately, they lacked any money to buy provisions. Solomon informed his wife that he felt he could not give her the five dollars after all. She was surprised—and more than a little disappointed. After all, the money was for things their baby would need. “I’m sorry,” he told her, “but I’ve had three strong warnings from the Spirit that I shouldn’t expect to use this money for the baby. Frustrated, Phoebe showed her husband the list of items that she had planned to buy with the money, but Solomon only told her that she should use the money from the sale of the butter and eggs to buy the most important items. She reluctantly complied, and bought all that she could with the little money she had. But she was so disappointed that on the way home she sat down on the wagon board, pulled her bonnet down to hide her face, folded her arms, and turned her back on her husband. 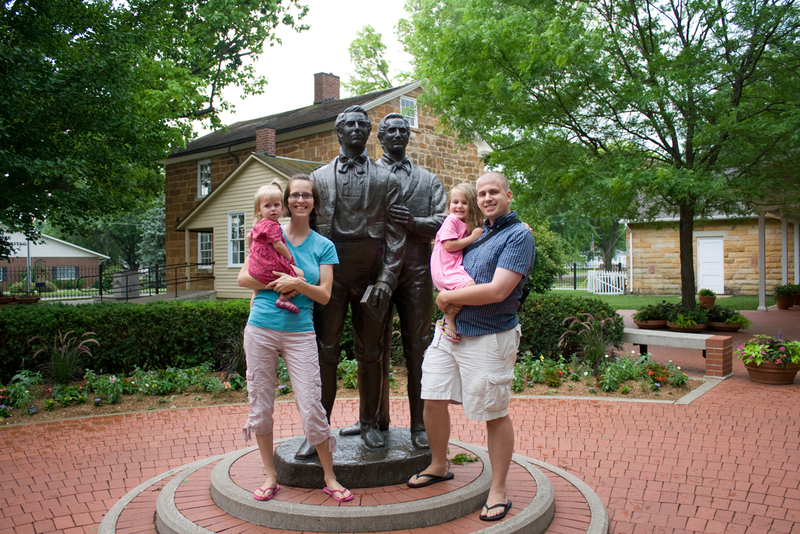 They had traveled only a little way when they came to a crossroads, where they were surprised to meet the Prophet Joseph Smith. 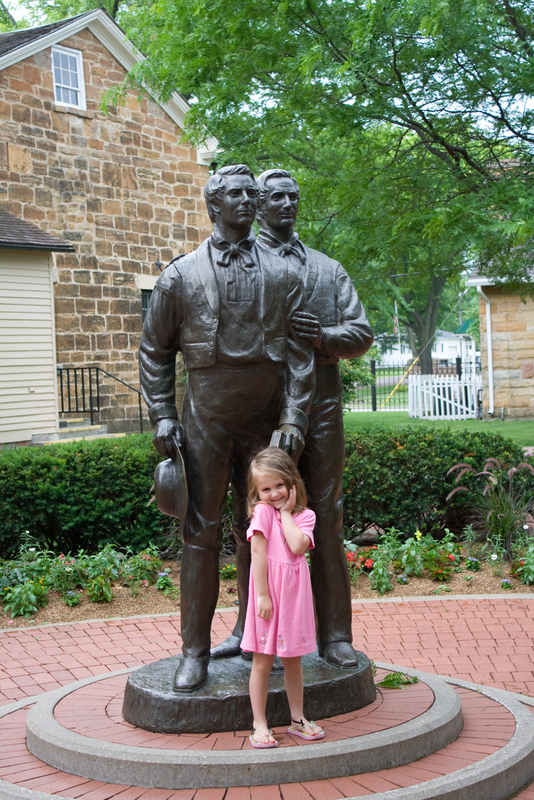 To their dismay, the men with the Prophet were taking him to prison in Carthage, Illinois. “Yes, I have,” Solomon said. The prophet never returned from Carthage. He was first held in the dungeon room, which was actually the second floor of the jail, but since it was June and very hot and Joseph didn't seem like such a dangerous criminal after all, the jailer moved him downstairs to the regular holding cell. Later, the jailer realized that Joseph's life was in danger since anyone passing by could easily shoot through the bars and kill the detainee behind them, so he moved Joseph into his own bedroom on the third floor. Then, on June 27, 1844, an armed mob (about 150–200 men strong) stormed the jail and began firing into the bedroom. 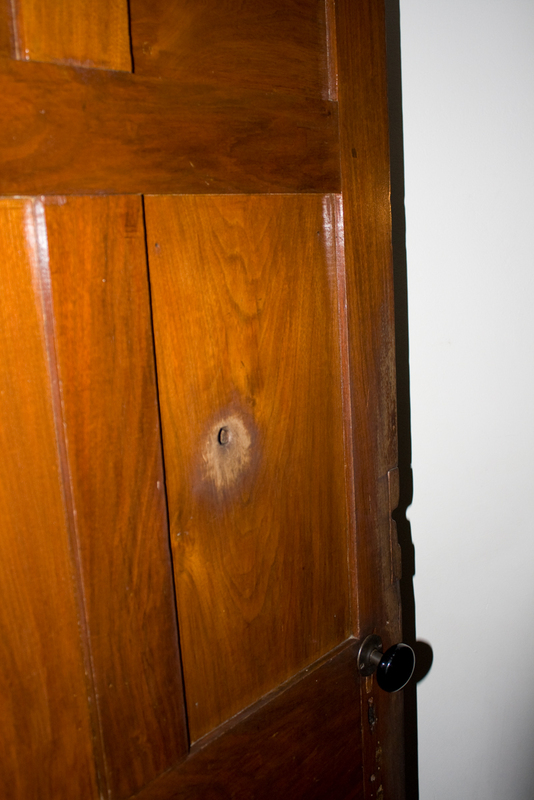 The first few shots were aimed at the door handle, a stray bullet pierced the door itself. 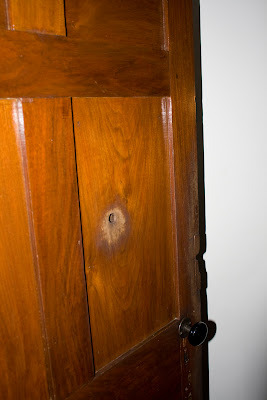 The original door is still on the frame; it was removed (whole) and put in a shed and later returned to it's frame during the restoration of the jail. After the mob was able to get their guns through the door to aim more clearly into the room, John Taylor tried to fight the gun barrels away from the door with his walking stick. It did little good. Hyrum Smith was shot in the face and died almost instantly. He was later shot three more times. 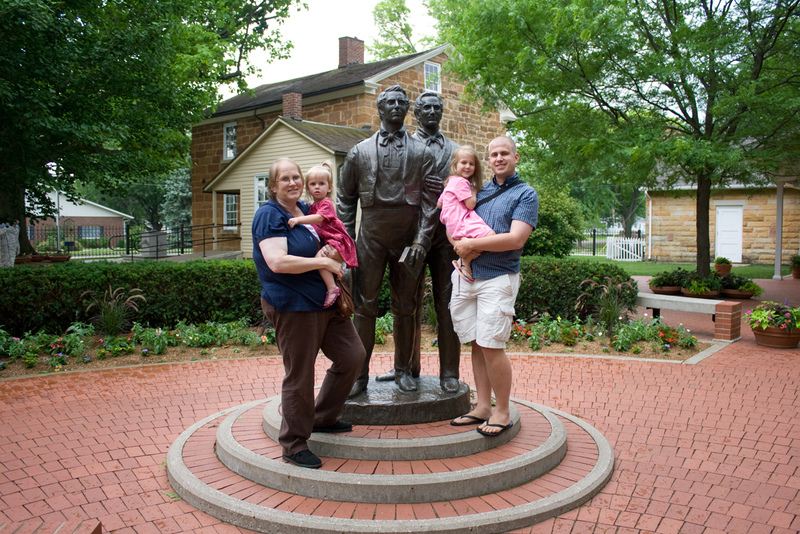 Joseph Smith leapt from the window (it's not a very far drop to the ground, really) but was also shot four times while attempting this. (Yup, that's the window; the one we're standing around looking so happy). John Taylor was also shot four times and ended up rolling under the bed. I can't remember what made the mob leave, but they did for a while, and Willard Richards took the opportunity to carry him downstairs to the dungeon cell to hide him in case the mob returned. John Taylor later became the third president of the church. 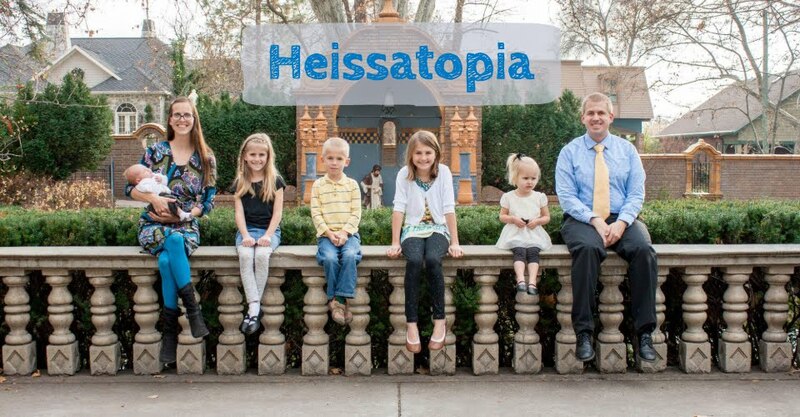 Not to get weird or anything, but I just thought I'd clarify what we, as Latter-day Saints, believe. It's hard for me to talk about my beliefs; I've taken a lot of grief for them in my time since not everyone is very friendly towards Mormons. Obviously. But I'm going to try and be open and frank. 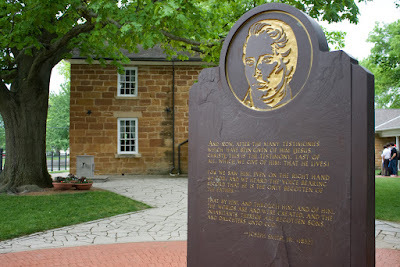 I've been asked before if I worship Joseph Smith. I don't, but I do revere him as a prophet of God. Joseph taught that "we believe in God, the Eternal Father, and in his Son, Jesus Christ, and in the Holy Ghost." We worship God. 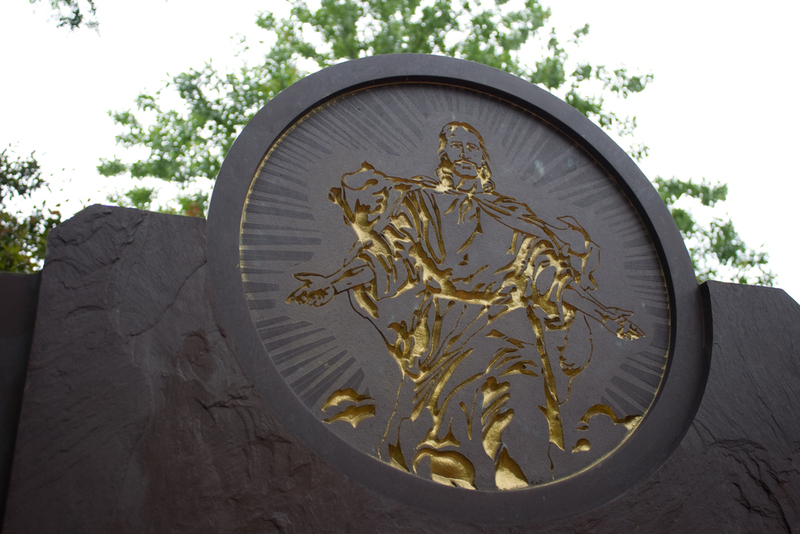 We believe Jesus Christ is the Savior of the world. That said, there's something special about visiting these historic places—something about being there that solidifies the stories we've heard. 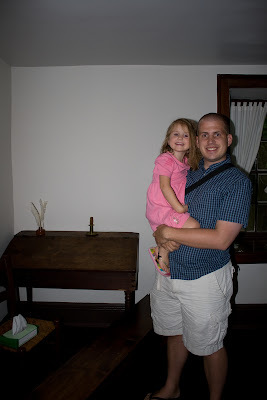 To stand in the room Joseph Smith died in was humbling and yet strengthening. He was willing to die for what he believed in; he sealed his testimony with his blood. "He lived great and he died great in the eyes of God and his people." So many others have died for this gospel, too. It amazes me to think of all the pioneers who died crossing the plains. Or even just thinking about Phoebe and her willingness to give up that $5 (even though she sulked about it). Sometimes I look at the faith I have and wonder if it's enough. Am I willing to part with $5? Am I willing to walk a thousand miles and lose all my children? Am I willing to die? Just for what I believe in? Though, let's be honest, I'm not sure I necessarily want to be tried with those tests. Except maybe the losing $5 for baby clothes one. I think I could pass that test (though I'd probably sulk about it a little, too... I mean, who wouldn't want to buy cute new clothes for something as cute as my kids?). Anyway, I'm so grateful for the opportunity to go to these places. My grandma Conrad kept a list of places that she wanted to visit. 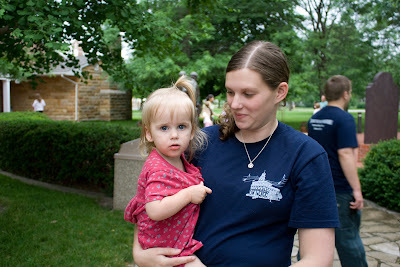 Her list comprised of: Palmyra, NY; Nauvoo, IL; Jerusalem, Bethlehem, Hawaii, and South American ancient ruins. She never got to visit any of those places, but, having been to Nauvoo, Jerusalem, and Bethlehem, I can understand why such special places were on her list. The Garden Tomb was my favourite place in all of Israel; most probably because of the time I spent reflecting on the Savior's life, atonement, death, and resurrection and what that means to me. Likewise, Carthage was certainly one of my favourite places we went to in Illinois, due probably to the time I spent reflecting on the prophet Joseph Smith's life and his death and what that means to me—that the gospel was restored. Now that I've been to Nauvoo, Bethlehem, and Jerusalem, I think I should probably get to visit Hawaii for my grandma, don't you think? To see if I can feel what Hawaii would have meant for her? Seriously though, I don't know how I'll ever repay Karen for giving me the gift of going to Nauvoo. It was certainly a special trip. She's awesome. We drove back to Nauvoo through terrible wind—remember those windy roads I mentioned earlier? Andrew said it was a little bit terrifying. 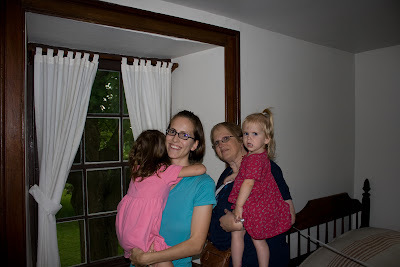 But we made it back safely and went to dinner at the Hotel Nauvoo. They had a good ol' fashioned buffet and their restaurant was so quaint. 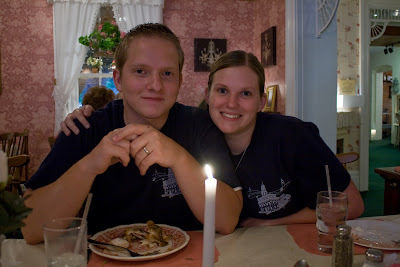 Candlelight, victorian wallpaper...it was perfect. That night, Grandma volunteered to stay at the hotel with the girls so that we could go out to see Rendezvous In Old Nauvoo. Emily and Morgan were supposed to be joining us but instead they ditched us to go on a romantic walk. I was never quite sure if the play was supposed to be funny or serious and ended up laughing more often than not, so I think it was funny. Mostly I kept thinking about how most of the men on that stage did not come to Nauvoo hoping to sing and dance and yet...here they were...singing and dancing their hearts out. Oh, it was hilarious. 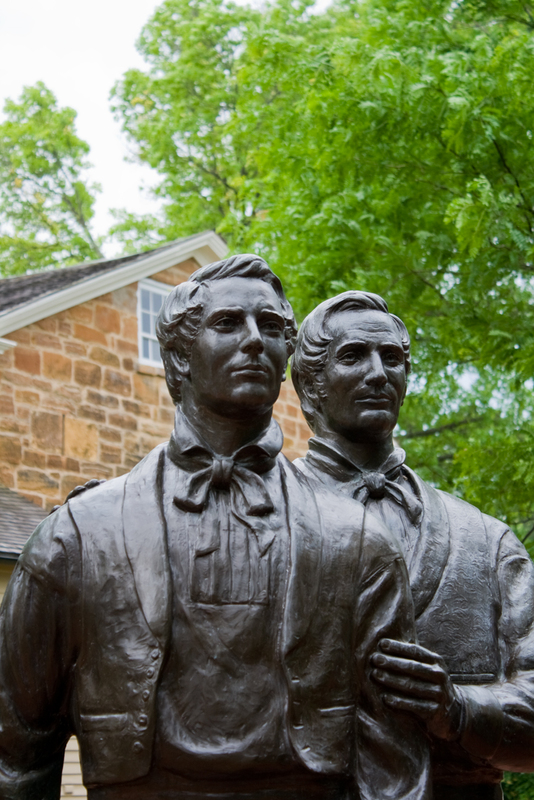 Just when we got to the part where they're announcing Joseph Smith's death and the need to start thinking about leaving Nauvoo, there was a dramatic thunder clap and rain started pounding on the roof. It added to the dour mood of the scene, but my thoughts kept turning to Emily and Morgan. Chances were, they were no longer enjoying their romantic walk. We found them after the play and they were drenched. When they got to the cultural hall (where the play was put on), the missionaries had let them down into the basement to get out of the rain without disturbing the performance. The lightning was crazy—the sky would light up in one spot and then it would fork out in all sorts of directions: up, down, left, right until the whole sky was ablaze. The thunder was equally terrifying. It was no small wonder, then, when we got back to the hotel and found that Rachel was still wide awake, and quite glad to have us safely back.